The Secret Adam – a Study of Nasoreaen Gnosis by E. S. Drower takes us deep into the pre-Christian spirituality of the ancient Persia. Still today there are remnants of the Mandaeans (“Gnostics”) also known as Sabaeans in Iraq who among other had a tradition of baptism. Their knowledge are historically accessible through a vast amounts of scrolls. In The Secret Adam, E. S. Drower outlines the history of the people, their thoughts and secret knowledge. 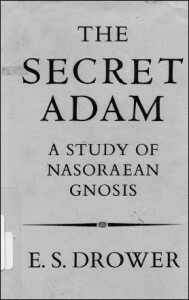 The Secret Adam – a Study of Nasoreaen Gnosis by E. S. Drower takes us deep into the pre-Christian spirituality of the ancient Persia.